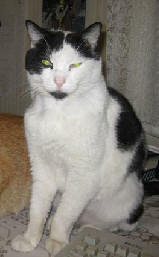 Mambo, a male black and white moggie, came into our family in January as a week old foster kitten. 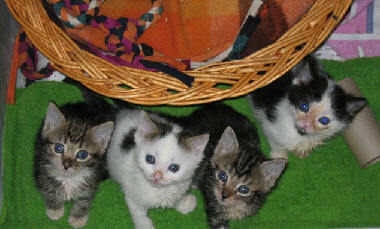 He was in a litter that had been brought into Sydney Dogs and Cats Home without a mum and I volunteered to foster them. There were four kittens and after a week I gave them all names ... Mambo, Scooter, Betty Boo and Betty Boo 2 (as they looked so much alike) for their profile on the Pound web site adoption page. 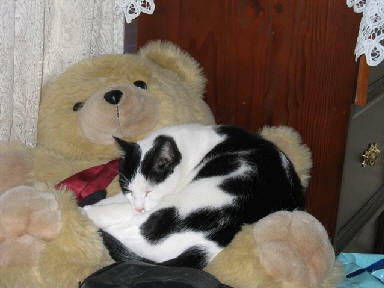 I named Mambo after a dear friend's black and white dog, never at that stage thinking I would adopt him. Mambo learned to come to his name within 2 weeks .... so clever!!! My husband had declared that we wouldn't keep any of these kittens as we already had two cats from previous litters we had fostered. Well that lasted just two weeks until Mambo became 'his mate' and here he stayed, settling in well with the other cats and our dogs. Mambo was a very adventurous cat and often climbed on our roof, or that of the neighbours, venturing around the neighbourhood, taking cat naps on the traffic island and even coming with us when we went on walks around the local streets with our dogs I nicknamed him the 'wild child of Banksia' as you couldn't keep him in. Mambo copied his brother and learnt how to escape through the lounge room window by clambering up and out a narrow slit above the air conditioner. Mambo was always a very affectionate and smoochy boy (bottom in the air when he was stroked!) but he didn't mind having a fight or two with any cat that invaded his territory. Sadly he picked the wrong one, a stray feral tomcat who attacked him, and an abscess developed. Itt was then we believed he contracted feline aids, although at the time we didn't know it, and his immune system would have been detrimentally damaged. We placed Mambo with our other two cats Gus and Jazz into boarding as we had done in the past when we went overseas in June 2009 but when we picked him up on our return on 6 August my husband noticed how bony he was, although still a very big cat. We knew something was wrong and so took him to our vets and when the blood tests came back they showed a dangerously low pac cell volume and we were referred to the Sydney University Veterinary feline specialist. Their diagnosis was not good and it was thought that Mambo may not live the night, but if he did he would most likely only have 3 - 6 weeks as no cat with his condition had ever lived longer than that. Mambo had mycoplasma, an infection in the kidneys with fluid in his abdomen and major issues with his gastro-intestinal tract. He had a blood transfusion and was also given EPO (the alleged drug of choice for the Tour de France!) and multiple other medications and was at 'death's door' for quite a while but eventually started to pick up. Mambo was at the vets weekly, then fortnightly and we willingly spent close to $10,000 to ensure he received all that was necessary to give him good quality of life. The Professor at the Uni called him her miracle boy because he continued to survive against all odds. Mambo would have periods of reasonably good health, although still on meds, and then the infection would return. He'd go on long term antibiotics and increased dosages of his other medication and then rally again. We tried everything, Vitamin B shots to stimulate his appetite and chemotherapy as it was believed he possibly also had a cancer. A diagnosis was not possible unless he had an invasive tissue biopsy done and he would not have survived the anaesthetic, let alone the magnitude of the surgery, which may not have given a definitive answer anyway. Possibly in denial, we went on holidays to the USA in October 2011 and left Mambo, with his brother and sister in the lovely cat suite at Beverly Hills Animal Hospital and under the wonderful care of vet Dominic and staff. He seemed be going well and was feisty when he had to have his weekly needles so I thought there was not a lot to worry about, well no more than normal. On 29 October I got an email from my sister to phone home immediately as she had not been able to get through on the mobile. I knew it was something important, but hoped it was only maybe the house had burnt down or been burgled as I could cope with that! But no, I was told that on 28. 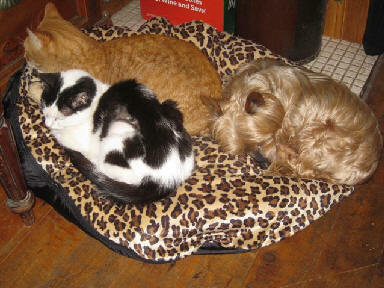 October Mambo had collapsed from a stroke and passed away shortly thereafter with Dominic by his side. It was such a shock and I lament that I was not with him when he passed away. Mambo fought a valiant battle to survive as long as he did against all odds and for that I am grateful. We all loved him, dogs and other cats included and miss him still as he has left a hole in our hearts that will never fully heal. Bye my darling boy, Mambopambo. 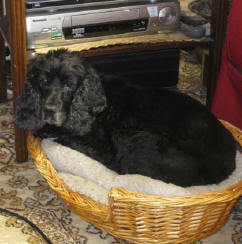 It is was with much sadness that we had to give our dear old girl Ebony her wings on 22 January 2011. Regretfully we were left with no choice, and no treatment that would have saved her. Her life's journey had come to an end and it has broken our hearts to have to say goodbye after only 4 1/2 years together. 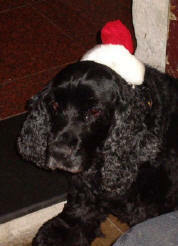 Ebony, was a black English Cocker Spaniel and was born on 1 June 1996. Her story before she came to us was that a couple chose Ebony and a brother from a litter of pups and they all lived together for 8 years . It was then decided to give away the brother to a family friend when a child came into the equation and they chose to keep Ebony. For whatever reason, the parents later decided that Ebony was not to live with the family and locked her away in another part of the house. Ebony apparently moaned and cried at being separated from them all and, to try and overcome this, they chose to sedate her twice a day and this continued for two years. According to the Pound's surrender paperwork, Ebony only got out for thirty minutes once a week for exercise. The mother worked from home but she later told me that it irritated her that Ebony thought 'that meant she could spend more time with the family'. 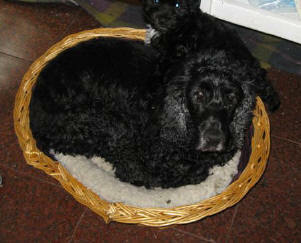 Eventually in 2006 the family decided they no longer wished to keep Ebony and planned to put her down. A neighbour intervened and kept her for a few days to satisfy herself Ebony was worth a chance and then approached Tracey Etchells, resident guardian angel at the (old) Sydney Dogs and Cats Home and asked if they would take her on and find her a new home. The Home agreed, and Ebony was surrendered by the owners. I was the Volunteer Co-ordinator at the Home at that time and, with soft spot for Cocker Spaniels, was touched by her plight. My husband and I had lost our previous Cocker Spaniel the year before to cancer so we adopted Ebony and I thanked God she was now free from that prison. Ebony fitted in well with the rest of our brood of three cats, Gus, Jazz and Mambo, and an Australian Silky Terrier named Patrick (all ex-SDCH graduates). She accepted us with no hesitation as her new family and it amazed me that she did this so quickly and easily. What struck me the first time I let her off the leash was her love of running. Ebony had the most joyous expression on her face as she bounded about finally free and, from then on and for virtually every day of her life (bar the last week), Ebony got two walks a day and at least one of them was always off leash. We did notice that when she first came into our family Ebony never brought herself into the loungeroom when we settled to watch television but would take herself off to bed. It seems 10 years of experience must have made her believe that she was not welcome to be amongst us. We would have to go and bring her in with us and my husband would carry her in and plonk on the lounge. It took a few months for her to understand we WANTED her with us. Ebony was quiet, docile and well behaved, save her occasional 'stand over tactics' with the cats to try and coerce them to hand over their dinner! She was a joy to have as a member of the family. In mid 2007, after noticing she had developed a constant thirst, we took her to the vets where she was diagnosed as a diabetic and put on insulin twice a day. We were due to fly off to the USA in a couple of weeks and her condition meant she needed frequent vet visits to stabilise her condition and settle her insulin dose. Thankfully Tracey Etchells, Pat Hood and Leanne (who are now all ex-SDCH staff members) stepped in and cared for her in our absence, taking Ebony to the vet to monitor her and getting her set on her new diet and to help her lose some weight. That was to be her lot in life ... insulin needles twice a day, regular days at the vet for glucose tests, a restricted diet and lots of exercise. Ebony accepted this, although the diet part was not too popular as she LOVED food, a common trait in all Cocker Spaniels. She would often find ways to try and add to her daily diet and learnt to raid the kitchen bin which she saw as a challenge. I felt mean when I had to put all food out of her reach or take it from her when she had succeeded but she accepted it all with no complaint. In 2009 Ebony did begin to slow up somewhat and lost most of her hearing. It was remarkable though that she could still wake up from a 'dead' sleep and hear the dog lead rattle at the other end of the house. Or she would hear Patrick as he barked in excitement at the prospect of a walk and come bounding to the door in case we forgot to take her too. Selective deafness .... my husband has that too!! Eventually Ebony refused to eat the strict, dry diabetes diet and was more picky with what she would eat. Over the next year I tried every known kibble, wet food, commercially prepared food and settled on chicken and pork fillets, learning to spot a "special" in the meat section of Coles from metres away! We learnt her calorie limit and worked in with this. She happily ate this, along with some BARF patties and a light dry kibble for small dogs. Ebony remained trim, taut and terrific and her weight never again became an issue. Her eye sight eventually began to fade and she had a cataract removed from her right eye in May 2010, eventually becoming almost blind in the other eye too. Ebony had a rough time after the eye surgery and had to go back under anaesthetic to reduce the severe inflammation that developed. She hated being in the clinic and refused to eat, which made her glucose levels drop dramatically. Until her death we had to work hard to keep her levels in order but, despite these trials, Ebony kept up her love of running, even though she could not run for as long or as far in one go as she once did. Ebony started her downhill slide around Christmas time, losing her appetite which made it a battle to keep her diabetes in check. She would pace throughout the house all night, from early evening on (this is called 'sundowners') only stopping to obsess with her water bowls, drinking large amounts then standing in the bowl barking on and off at the wall, hour after hour. Recently prescribed Valium did diminish this most nights and we were hopeful of more time with her. Ebony was also prescribed a medication for the dementia and tests had shown every other part of her body was in good working order so the only one we didn't know about was her brain. Seemingly it was this that let her down and it was likely that a brain lesion was the cause of these symptoms. I am now so grateful that I had a wonderful day with Ebony the day before she died. She had slept well the previous night, ate a reasonably good meal and was alert and happy ... the Ebony of old. I had given her a bath first thing and it seems also a new lease of life as she jumped and ran and laughed, happy and contented. We went to an off leash park which was one of her favourites and she had a ball of a time, racing around like a pup, up and down in a playful mood. She slept the rest of the day and didn't really want a walk that evening but I insisted on her having just a short one. She had her sedative, but it didn't work at all and she refused all food, despite me tempting her with nine tasty dishes. Ebony paced and moaned, barked and obsessed about water all night from 9pm to 7.30am the next morning when she took herself up into the garden and had a severe and prolonged seizure. When she came around she was blind, totally confused and distressed so we raced to the vets but were told there was nothing more that could be done. We took Ebony away to spend a last few hours with her, after she had been given a shot of valium to calm her down and ease the distress. We took her for a paddle in the river and a short walk, then a car drive which she always enjoyed and she settled and went to sleep. 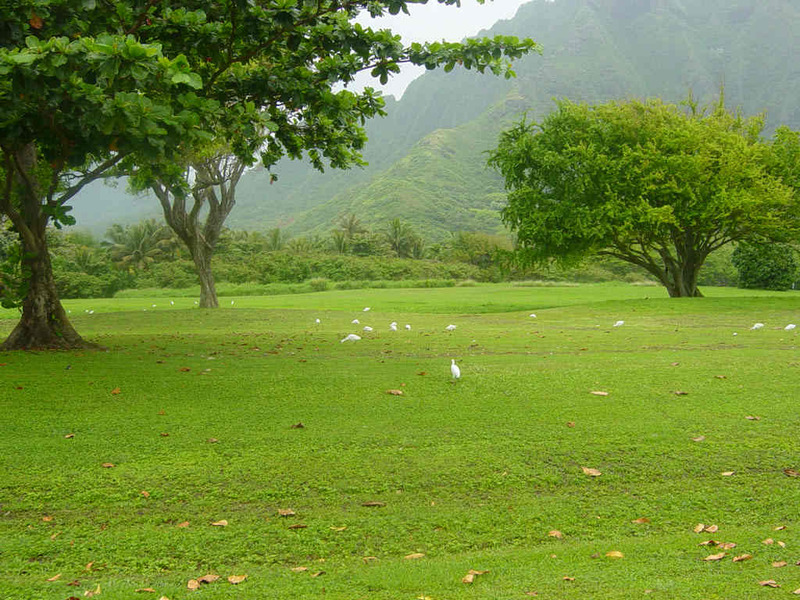 Once back home she had short periods of sleeping but increasing periods of confusion and distress. We knew it was time and went back to the vets for the final journey. Thankfully our wonderful vet Peter Nicholl had come in and was able to send her on her way, peacefully and with no distress or pain, with us by her side scratching her ears which she always enjoyed. I will always have fond memories of Ebony running and how she would laugh cheekily at me as she bounded past, dancing and prancing around me. She seemed to know I enjoyed seeing her do this and I often wondered if perhaps she did it more to please me. Ebony is at peace now, free from pain and in no more need of needles or medication. R.I.P Ebony, and thanks for the love and happiness you brought into our home and family.